of Shreveport is a local onestop shop for plumbing, lighting and hardware needs. More widely recognized as LCR-The Plumbing Warehouse, the showroom itself is now known as Facets of Shreveport. “We’re another facet, if you will, of LCR,” explained team member Holly Donaldson. 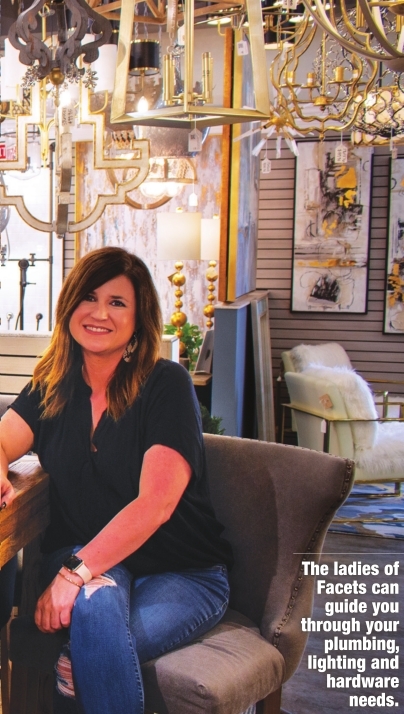 Facets is a fullscale showroom offering plumbing, lighting, door hardware and cabinet hardware to select for both new construction and remodels. “Besides the incredible people I work with, my favorite part of my job is simply being a part of the experience. Building a house or remodeling takes a team effort, and I love the feeling of knowing I’m a small portion of that team,” said Donaldson. 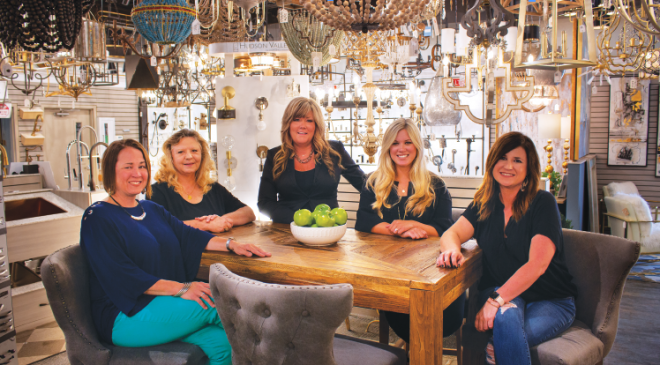 Each team member brings a personal sense of style and a wealth of knowledge to the showroom. For example, Stevenson’s favorite plumbing fixtures are the Purist line from Kohler in Polish Nickel. She also loves the Savoy House and Capital Lighting brands in lighting. “No matter how traditional or modern your taste is, I can find something in either of those companies to make any customer happy,” Stevenson said. “The Jason Wu faucet from Brizo is my favorite,” Donaldson said. “It’s the little black dress of plumbing. In lighting, I love everything Mitze. They’re a little funky and a whole lot of fun!” According to Stevenson, current trends are black-and-white color schemes with a fun pop of color in the room. English is seeing a rise in trends of soft gold and mixed metals in the local area. Head agreed. “They create a comfortable, warm feeling that ‘matchy-matchy’ just does not create,” Head explained. Looking toward the fall and winter, Stevenson expects to see more earth tones becoming popular. “Leafy greens, relaxing and natural woods, concrete and mixed metals are where it’s heading,” Stevenson said. “Gold is hot, but black is the new neutral,” Head said. “Less is more. Wood combinations with silver or gold accents are also coming on strong. We’ve been using black hardware for a while now, but to have the option of black facets is a home run!” “Matte black plumbing fixtures create a sculptural piece that is as beautiful as it is functional,” English said. “Militaristic pieces are also on the rise recently. More natural materials, stones and woods will be making an impact as well,” Donaldson said. Facets of Shreveport is located at 235 Lynbrook Ave. and is open Monday-Thursday 8 a.m. to 5 p.m. and Fridays 8 a.m. to 4 p.m. For more information, call 318-671-1200 or find them on Facebook. You can also visit www.facetsofshreveport.com and shop/browse lighting selections or make a wish list, right from the comfort of your own home.